Carnegie is located approximately seven miles west of Pittsburgh and ten miles east of the Pittsburgh International Airport. Now considered a suburb of Pittsburgh, the Allegheny County borough often makes news headlines because of the special events at the recently restored Andrew Carnegie Free Library & Music Hall and the impressive selection of restaurants and shops along Main Street. 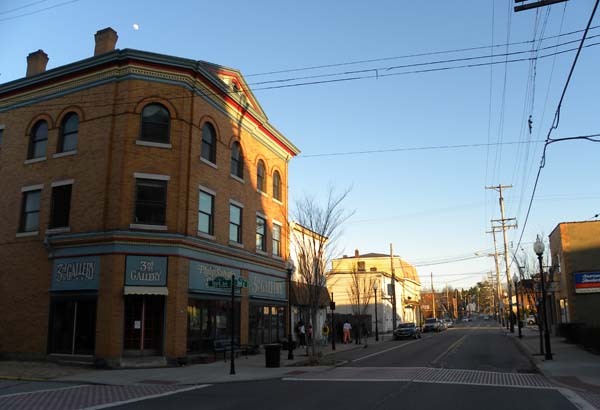 Historically, though, from 1890 to 1960, Carnegie was a commercial center for the surrounding farming villages and coal-mining camp towns such as Moon Run, Imperial, Oakdale, Kirwan Heights, Sygan, Cecil, and Muse. Explore the Main Street area with docents from PHLF and hear about the community’s resurgence, as well as the early settlers, the notable residents (including baseball hero Honus Wagner), the mills, railroads, commerce, floods, and library––the only one of several thousand permitted to use Andrew’s first and last name. Paid reservations by Tuesday, October 9, 2018. Parking: There are several surface parking lots in Carnegie. Honus Wagner Plaza is at 1 Third Street, Carnegie, PA 15106. Another surface parking lot is adjacent to the Citizens Bank (11 West Main Street, Carnegie, PA 15106).